A clean, professional and attractive work environment is essential for your business. Not only does a fresh and tidy appearance signal respect for your customers and staff members, it also translates into business efficiency. You and your staff are free from cleaning, dusting, and vacuuming at the expense of your valuable and expensive labor time. As an owner, you may not be actually cleaning or even directly supervising office cleaning. However, someone in your office is. And, certainly you didn’t hire him or her based on this skill set. Instead, maximize overall work hours on tasks that are more valuable to the company. Choose a janitorial company to make the best use of your time and theirs; find a team to clean that complements your staff’s schedule. Dirt and grime can cause harm to more than your staff’s health. The office or factory is filled with valuable assets prone to damage in a dusty environment.Poor cleaning practices can cost you more in repair and replacement costs than proper cleaning costs. By outsourcing your cleaning services you’re protecting your investment in computers, electronic, and delicate machinery. Federal law is specific about the employer’s responsibility to label and organize cleaning supplies. The Hazard Communication Standard (HCS) requires chemical manufacturers, distributors, or importers to provide Safety Data Sheets (SDSs) (formerly known as Material Safety Data Sheets or MSDSs) to communicate the hazards of hazardous chemical products. If your staff does the cleaning, you need to comply with safety regulations about the use and storage of all these products. However, when you outsource your cleaning to a professional team, they will help you organize and manage any hazardous chemicals on site. They understand OSHA regulations and how to safely operate and use all equipment and cleaning supplies. Technologies in the cleaning industry are always improving, but to keep up with them? Using inexpensive or outdated cleaning equipment takes more time and increases your payroll costs. The most modern equipment used by skilled janitorial staff will improve cleaning efficiency. Plus, you won’t need to invest capital in the latest machines but you’ll reap the benefits. Many cleaning tasks that cannot be performed properly when the building is occupied. 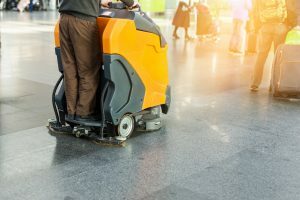 When professionals clean after hours, they can efficiently and effectively dust and disinfect of personal areas, sterilize trash cans and thoroughly clean floors. When the staff and customers are present, certain types of equipment, such as vacuums, make too much noise. Bathrooms can’t be disinfected deeply enough. Take advantage of downtime and maximize cleaning efforts with a professional cleaning team. Time To Call Hitchcock Clean And Restore? To improve your efficiency at work, call a professional janitorial team that you can trust to tackle your facilities quickly, safely and to your high standards. Hitchcock Clean and Restore is a locally owned and operated company specializing in commercial cleaning services. Contact Hitchcock Clean and Restore, Berks County’s #1 rated response company at (484) 575-4101.